David Halpern is a British psychologist and civil servant, heading the Behavioural Insights Team (unofficially known as the Nudge Unit) spun out from the Cabinet Office. Halpern attended King's School, Rochester, before attending St John's College, University of Cambridge to read natural Sciences specialising in experimental psychology. He then went on to complete a PhD in social and political sciences, also at St John's College, Cambridge. Since October 2010 Halpern has been director of the Behavioural Insights Team, initially as part of the Cabinet Office and since 2013, as a partially privatised venture. Prior to that he was director of the Institute for Government from 2008–10, where he is a senior fellow. from 2001-07 he was chief analyst in the Prime Minister's Strategy Unit. 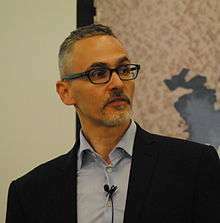 Prior to work in government, Halpern was a lecturer in social human sciences at the University of Cambridge (1996-2001), a Nuffield College, Oxford prize research fellow (1993–96), and a research fellow at the Policy Studies Institute (1991–94). He currently is a visiting professor at King's College London. Options for Britain (1996 and 2010). The Hidden Wealth of Nations (2010). The MINDSPACE report (Influencing behaviour through public policy), co-author. 1 2 3 4 5 6 7 8 Benjamin, Alison (5 February 2013). "David Halpern: 'We try to avoid legislation and ordering'". Guardian. Retrieved 27 July 2014. ↑ "Whitehall 'Nudge unit' to be part privatised". BBC. 1 May 2013. Retrieved 27 July 2014. ↑ "Institute for Government - our people". Institute for Government. Retrieved 27 July 2014. ↑ "King's College London Halpern". Retrieved 23 November 2016. ↑ "Options for Brittain II". Retrieved 27 July 2014. ↑ Halpern, David (2015). Inside the Nudge Unit: How small changes can make a big difference. WH Allen. ISBN 978-0753556535. ↑ MINDSPACE report (PDF). 2010.